To start with, I’d like to congratulate this cohort of graduates upon coming to the end of their five-year long journey at the college of applied sciences. Upon this happy occasion, I’d also like to congratulate the students’ families, the college staff, and the ministry of higher education. This cohort combines the seventh batch of graduates majoring in Information Technology and the first batch majoring in Engineering. It is, therefore, their fair right to feel proud standing on the graduation platform at the college that has hosted them for the past five years. It is this same institution that has joined them with their peers on classroom seats, and introduced them to their devoted teachers and supervisors. This memory will long last as one of the most profound stages of their lives. It will be the part of the memory that reminds them and us of the learning experience as well as the substantial journey towards development on this blessed piece of land. Oman, this land, has offered so much to its sons on the hopes that the day will come when these young minds work together to build this land’s present and future. These aspiring souls are still alive and fueling on the far-reaching Omani history using the same limited but determined hands to secure their daily needs. These hands were put together to plow lands and channel water through steep mountains in order to spread life. The same hands grew palm trees to provide food and altered their wasted parts into daily used tools. The same hands went on and built entire homes out of clay and palm tree branches establishing a system of self-sufficiency for hundreds of years. And driven by the desire to communicate with the world around him, the Omani citizen made his boat out of branches, drove it into water and harnessed the sea wonders. He stood on the ocean’s shore aspiring to communicate with the worlds’ civilizations to exchange human’s experience. This is what the Omani has always been characterized with, a determination that knows no boredom, and relentless endeavor. Hope is now in your hands dear graduates. It is our hope that you recognize the size of the responsibility placed in your hands and carry on the legacy that led us here. What is well known about Oman and its people gave it the glittering reputation it owns today. This is considered a plus in the Omani experience, and a positive that has to be sustained when taking part in any kind of work. Developed nations surrounding us took the lead mainly when their citizens, not only found but also, lived the principles they sat for themselves setting good examples in integrity, honesty and good manners. Then comes creativity that’s the creator’s gift to mankind but which can also be enhanced through education and experience. Businesses that targeted Oman came solely to benefit from Oman’s inherent blessings and its fertile soil. This led to the creation of a rich job market for our sons and daughters. 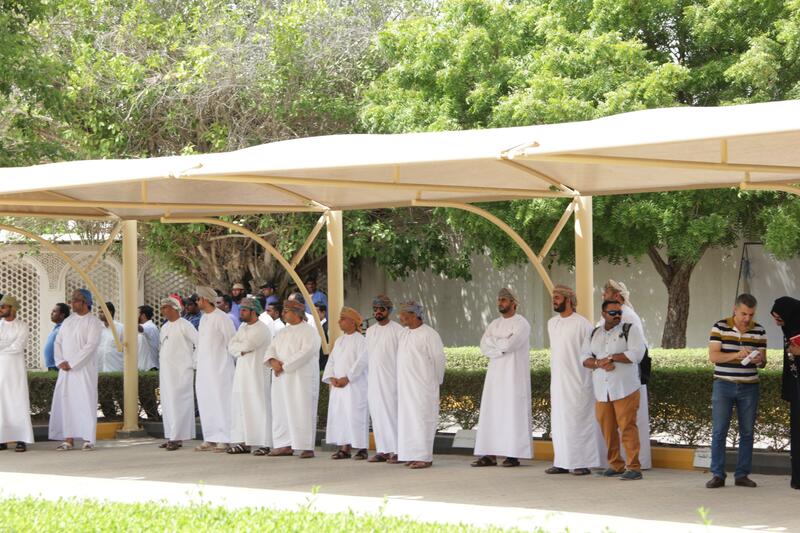 It is now our duty (Omanis) to prove our ability to harness these opportunities in the best way possible. Finally, I pray to Allah so He leads you all on the right path, and blesses your days with joy in this dear homeland.